All of the below information comes directly from job reviews written by DCC plc employees based on 53 reviews. DCC is a FTSE 100 company which provides international sales, marketing and support services with a clear focus on performance and growth. DCC is the kind of organisation ideally suited to building a graduate career. Our programme is designed to develop talented, ambitious graduates to be the future of DCC. Our aim is for you to begin a long-term international career at the highest levels of the commercial world. DCC operates in four different divisions: DCC LPG, DCC Retail & Oil, DCC Healthcare and DCC Technology. As a result, our graduates get to explore a wide range of career paths across a number of different industries. DCC can offer you variety, exposure and responsibility in a constantly growing organisation. We can give you the opportunity to experience life in another country, run commercial projects from beginning to end, work in different DCC businesses and divisions and develop to your full potential. No matter what your background is in, you can apply to any one of our five streams: Business IT, Business Management, Logistics, Marketing or Sales. You do not need to have any prior experience in your chosen stream, just an interest in it. 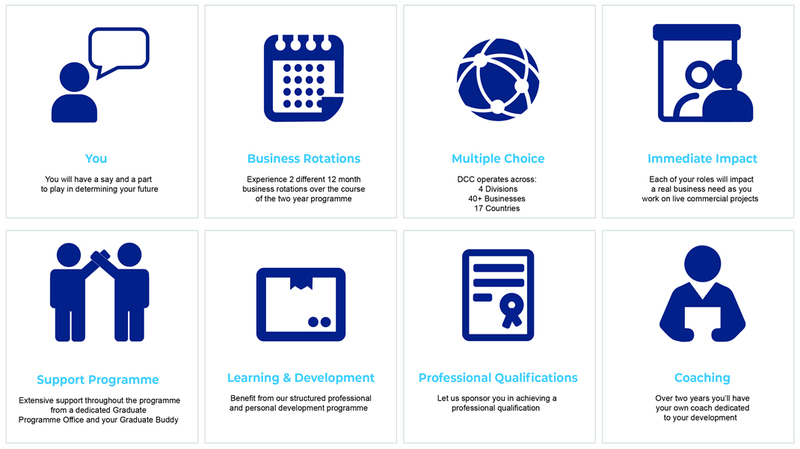 Learn more about the DCC Graduate Programme and how we together can accelerate your future on our programme by visiting dccgraduateprogramme.com. Opportunities for further study, large amount of responsibility given to graduates and good support network. Variety of tasks and breadth of experience. The variety of the roles we have been in. The exposure to very experienced members of the business. The option for further learning. - Access to high level managers who are always willing to give advice. If you have skills in foreign languages, include this in your application. As a global company, DCC is interested in these skills. Ensure you have examples of when you have used your skills in the workplace, university etc. When presenting, make sure you have documented the sources of facts and statistics. Research the key metrics of the company and apply these to the questions. Answer any questions honestly and convey why you are applying for the role and what you can bring to it. Be yourself and show enthusiasm for wanting the role. Do a lot of research on the company and when presenting ideas ensure you have a strong reasoning behind the ideas. e.g. give an example when you have overcome a conflict in a working environment. e.g. give an example when you have worked as a team to achieve a common goal. Be very aware of your own character traits and how you gained those in the past. Both interviews were competency based. Prepare some real-life examples that showcase your strengths as you will be asked to provide real-life examples. Research about the company and the position you are applying to and customize your application and be confident and true to yourself. Being yourself is very important as well as knowing the company and the position to then translate how well you integrate into it. Make sure you have a good knowledge of how the DCC group as a whole operates: its different sectors, companies within these sectors etc. Be confident and give real world examples in answer if you can. Try to stay away from theoretical examples. Read everything you can about the company and the role. If you, following that, still think that this is something that you want to do, that you would thrive doing; go ahead. If not, save yourself the hassle. Just be yourself, and try to use all the interviews to find answers to the question "is this company right for me", rather than trying to answer the question "am I right for this company". Watch the graduate programme video on the website and make sure you would fit in with the culture of the company. Make sure you have prepared thoroughly. Be open minded about the relocation/role changes, it is one of the best parts of the graduate scheme. Be confident, not cocky. When answering interview questions use real life examples of how you have displayed the behaviours the company is looking for (leadership, commercial focus, entrepreneurial spirit, drive for results etc.) in a work/educational environment. Research the company and prepare various examples for the competency-based questions. Articulate end results for the examples you use. Have a view of where you think the company will/should go strategically. Ensure that you have everything you need for the timed aptitude tests before hand and remain calm when completing. Ensure that you do thorough research on the company and be prepared to justify you're strengths with real life examples. Research the company to understand what it does and have an idea of the types of markets / industries it's in. Consider the roles that you're interested in and have strong reasons for why you'd be a good fit. Be yourself! That was the advice given to me and as basic as it sounds it honestly is true. When in group activities don't feel pressured to talk over people and stand out, showing you can listen and understand is as important as getting your point across. Make sure your presentation is short and succinct and focus more on the potential questions you could be asked- why you chose your sources and why they are relevant. Also learn any references/sources you used as this is asked quite frequently. Don't skip answers on the logic tests held at the assessment centres. Even though the test is negatively marked, abstaining from an answer will statistically make you do worse. Make sure you talk about your acheivements as that is why they are interviewing you in the first place, because they have read your application and liked something there! Make sure you have a broad knowledge of DCC's financials and operating structure and know some of the names of subsidiaries. Do lots of practice for the online psychometric testing - the more you practice, the better you will be. Research the role and the business fully. Make sure you know what they're looking for and show that you have those skills/competencies in your application. Prepare fully for your interviews, make sure you have lots of real life examples which really show that you have the required competencies and you have developed these through your degree and work experience. Watch the video on the graduate mirco site to identify the skills and characteristics they are looking for in a graduate. Be sure to highlight these in your application. Focus on identifying the skills and characteristics in the aforementioned video and give specific answers of times you have demonstrated these. Know the company and it's competitors inside out. Relax and think your answers through thoroughly. Be honest, be clear about what your aims are and what you want to achieve within a company and always keep an open mind. The scheme expects you to be flexible, not only with location but also with jobs you have to take part in. Some are more full on and intense than others so it's important to be flexible and determined. Make sure you have plenty of competency questions practiced; have your answers planned out and examples of situations you have been in. Be yourself. There is no point pretending to be someone you're not as the company looks for people that will fit in with their ethics, so be open and friendly and you'll be fine. Make sure your appearance is professional as sometimes people's business dress let them down I think. Start early take your time and think about your answers. Be honest and show your personality in the process. Be prepared and don't waffle. Have interest in business and adding value as opposed to being interested in a particular industry as the company and program is so diverse. Don't be too worried about your understanding of the business, and vague understanding and being able to show you researched them is plenty. Seems cliché but just be yourself. They know what kind of person will suit the program, you may not be suited! Remember that all those in the interview and assessment process are human. Don't be too robot just relax and talk to them like one of your relatives. Be professional but not stiff trust me it will relax them and you far better. Make sure that you are willing to be adaptable and flexible due to there often being a lot of changes in plans and moving around. Make sure you have plenty of examples to demonstrate key behaviours. Questions will all be based around the companies core competencies. Must be willing to move about and open to change. Make sure you have real life situations of when you showed a particular skill or ability. Be willing to move and challenge yourself from day 1. Guidance is given but you are expected to contribute from day 1. It sounds like a cliché, but be yourself. It's not so much about what you know (you will be rotating in 3 different functions) as much as it is about your attitude towards learning and development. If you are an entrepreneurial type this is definitely the company for you. If you make it to the assessment centre relax and enjoy yourself (while remaining professional of course) - nobody is there to catch you out. Make sure you understand how DCC makes its money, and from this consider the main drivers in DCC and make sure you can apply previous experience to these drivers. Also research some of the subsidiaries of DCC and there are more than you think! Result: What was the short term outcome of the scenario, and what are the longer term outcomes that have arisen from your actions? Don't worry too much about what your degree was in, the application process focuses on you as an individual and your own strengths. Get to know the company and the industries well and use the interview to find out more. DCC has a difficult structure to understand and it's understandable that you won't know everything about the company. Use the interviewers to find out more. Make contact with someone from the company and use them as a resource in the lead up to the interview. Give yourself plenty of time to complete the application. Answer all the questions truthfully and relax. Research the company and tasks given thoroughly. Relax and be yourself. The application process heavily relies on tests (numerical, verbal, logic, psychometric) so practice on all of them before hand. The company as a whole is looking to grow more internationally, so if you have a passion for travel, other cultures or other languages make sure to include this. Of course, if you have any international experience, get that in too: language classes; exchange placement; travelling; international internship etc. 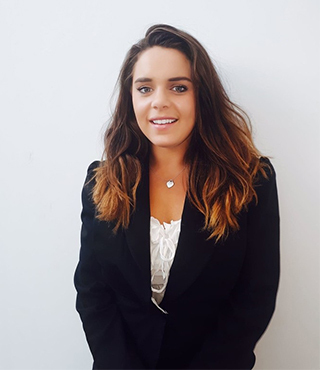 Don't feel overwhelmed by the apparent complexity of the corporate structure compared to other companies with graduate schemes. I spent hours revising this and wasn't asked a single question on this through the entire process. If they get you to do a presentation, make sure you have sources and reasons why you used those sources. It was the first question they asked me in the Q&A afterwards. The advice I would give to anyone on the final interview (or even the phone interview) is that something in your application has got their interest - don't be afraid to refer to, or elaborate on, what your wrote on the application - this is what they want to hear! Look at the big picture, the group defines the subsidiaries so look at where DCC is going in the future, they are highly acquisitive and their acquisition activity will be indicative of where they expect growth moving forward. Improve your knowledge of the existing business across all industries as you may end up working in any of these. Show them that you are flexible on location/role - they look for this. Compare different existing businesses in a different country - where should DCC look to invest, questions about your personality and attitude more than experience. Know your strengths and focus on them. People can focus too much on improving their weaknesses at the detriment to amplifying their positive traits. But know that when you apply you should always structure your strengths two ways - 1. Why I'm good at it something and 2. How this strength will benefit the company if they hire me. People mostly concentrate on point one which is a huge mistake. Prepare everything. Do practice tests, research questions they could ask you. Do your homework for any interview basically. Be you and don't be afraid to write down something that may seem a bit quirky - it'll help you stand out in the crowd. Have a look through the competencies the company are looking for. It won't hurt to prep a few answers that would show how you demonstrate what they're looking for. Take enough time to complete the application thoroughly. Research the company before the interview. Knowledge of the DCC businesses, an eye for the group's strategy and a sound understanding of the key financial ratios that all Plc. are measured by. For every question you are asked, try to relate it back to real-life examples that are recent. i.e. in the last two years. If you cannot think of an example, be honest and outline what you WOULD do if you were in this situation. However, for the written application you should really try and think of experiences ideally in a job (part-time) or during university. Interview advice is similar to application advice- make sure everything you say can be related back to a real life example. If they ask you a question, answer it and say what you WOULD do in the situation, then follow up with a "I have experienced a similar situation in group work in university when I...."
For the aptitude tests, the biggest challenge is time. So make sure you practise as many examples as you can online before the actual tests. The application process is quite lengthy, but stick with it. What you're going to get from this role, should you be successful will be well worth it. The process may have changed since I applied, but when I applied there was an online application to fill in, then a telephone interview, then psychometric testing and then finally an assessment centre. To be a good fit for the scheme you need to be quite flexible and have good adaptability skills to be able to cope with relocating every 8 months. Make sure you show good communication/people skills and drive for results. The recruitment process is similar to other graduate schemes. Prepare for numerical, verbal and logical tests and prepare for a competency based interview. At the assessment centre you'll also have to take part in a group exercise and do a presentation which you'll be able to prepare in advance. Be prepared for a wide range of different experiences including; change of job roles, change of location etc. They are looking for real life examples where you have shown leadership, teamwork, quality etc. so make sure you back up any claims you make. Relax, they don't try to catch you out. The interview feels almost like an informal chat about you and your experiences. The presentation and group exercise are a bit more formal so it is important to come across confident with belief in yourself. Know your industry area well and be prepared to share your understanding of DCC plc. Have relevant experiences which demonstrate you have the skills to be successful and stand out from the crowd. Learn about the company and the markets in which they operate. Make sure you are up for a challenge, and that you are willing to be independent. There is not a lot of hand-holding, at least not in my experience, which is good but not for everyone. Some people would probably prefer a softer entry into work life, and if so, then this is not for them. The interviews very much focused on your personal competencies, and how you have applied these in the real world. The best advice I could give would be, make a list of all your strengths, find an example of how you have demonstrated them in real life, and another that shows how you would then apply that within the workplace theoretically. Candidate will most likely be rewarded for showing that questions have been thought about, and that considered, practical responses are given. Make sure to research DCC and how it operates. It's quite a unique company as it has a strong presence across several divisions rather than just one! Also make sure that you understand how the graduate programme works (3 rotations in 3 different companies) and why you see this as an opportunity for you to learn from and contribute to DCC as an organisation. Avoid making vague statements during your interview - make sure to have solid examples of times that you displayed particular skills. Due to size, necessary changes can be very slow to implement.